CyberLink has rev’d to the next version of PowerDVD, now with 8K support. Hardware support remains the major issue with playing back greater than 4K content. With a Intel 7th Gen the minimum for UltraHD Blu-ray, Core i7 with 630 GPU or NVIDIA GTX 10 for 8K (note, NVIDIA GPU won’t support UHD BD though), but the i7 with 630 graphics can’t handle VR. So we’ve ended up with a crazy matrix where one feature, precludes the use of another. Taipei, Taiwan—April 16, 2019—CyberLink Corp. (5203.TW), today announced the release of PowerDVD 19, the latest version of its leading movie and media playback software. PowerDVD 19 builds on CyberLink’s legacy of cutting-edge playback technology, with video playback support for Ultra HD 8K and 4K HDR content. PowerDVD’s playback engine now also boasts native 64-bit support, allowing for Ultra HD 4K video to be enjoyed in better-than-original quality with unique TrueTheaterTM audio-visual enhancement technology. A significant upgrade to PowerDVD’s playback engine helps deliver native 64-bit support allowing for Ultra HD 4K video quality to be upscaled thanks to CyberLink’s patented TrueTheaterTM Color, Lighting & HDR technologies. Already supporting all major file formats and codecs, including those not natively supported by Windows such as HEVC (H.265) and new HEIC/HEIF image files, these latest updates make PowerDVD the leading player on PC and the ultimate addition to Home Theater systems. PowerDVD 19 continues to guarantee better-than-original video and audio playback for Ultra HD Blu-ray, Blu-ray, and DVD discs, major file formats and codecs, as well as 360˚ video. PowerDVD 19 also introduces spatial audio support for 360˚ videos, making VR video feel almost as real as being there in person. In addition, PowerDVD enables online entertainment to be more accessible, with users able to connect and watch YouTube Live, 4K, and HDR videos, or “pin” videos to watch offline later. 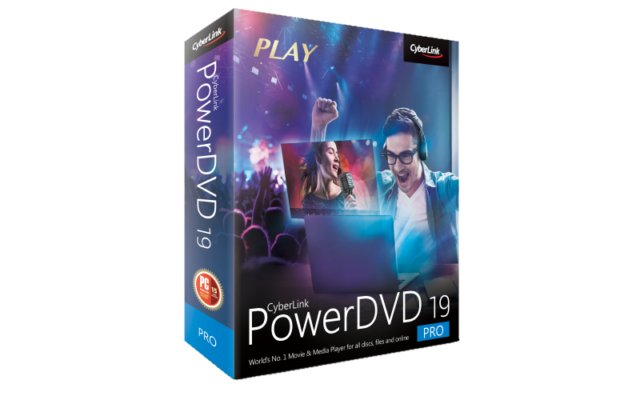 PowerDVD 19 is available for purchase from CyberLink’s online store.